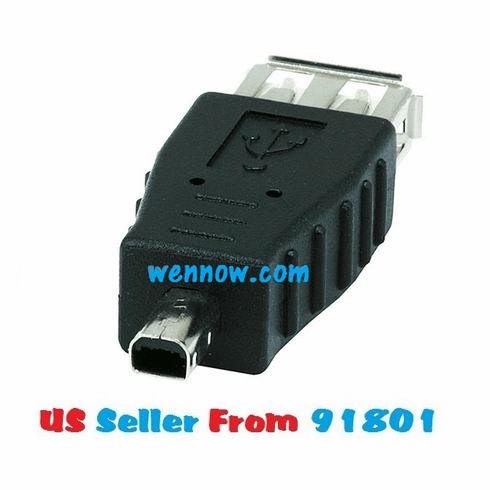 For connecting onto a type A male end of a USB cable to convert it to a male mini B 4 pin connector. The adapter has a female Type A on one side and a male Mini B 4 pin on the other. Please Note: USB devices generally consist of host devices such as computers which usually have type A ports and down stream peripheral devices such as printers, cameras, etc, which use a Type B or some variation of mini or micro type B. When connecting two devices together it is important to have a host on one end and a downstream device on the other. The host device initiates communication, so if two downstream devices are connected directly to each other without a host, they will just sit there waiting for the other to initiate some action which will never happen. If two host devices are connected together, they will generally conflict since appropriate drivers to control another host are not available. The only downstream device that will connect directly to another downstream device is a hub or a device acting as a hub through which the secondary device can access the host through the first.